The top Iranian discus thrower, Ehsan Haddadi, has been eliminated in the preliminary stage of the 2008 Olympic Games in Beijing. The 23-year-old Haddadi ranked 17th with a 61.34 meters throw on Saturday morning. According to ISNA, Hadddi blamed his poor results on his injuries. He left the complex while crying intensely and being hugged by his fellow teammates. 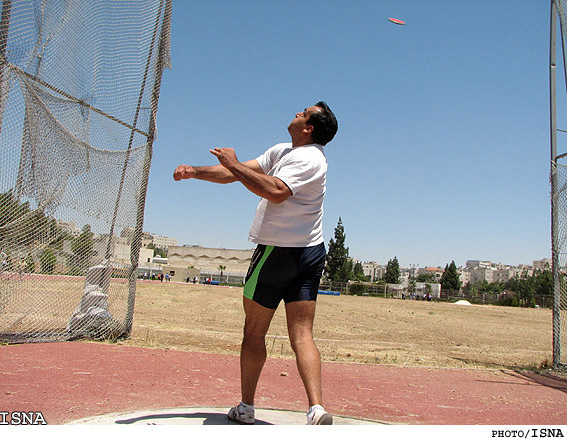 Another Iranian discus thrower Abbas Samimi ranked 26th out of 38 aspirants with a 59.92 meters throw the same day. Only 12discus throwers were qualified to move on to the next stage the competition. According to ISNA, Abbas Samimi said he is retiring from competitions for good. He's hoping that his younger brother will earn a medal in the London Olympics. Haddadi, the Asian discus record holder, improved his own Asian record at the Golden League in Berlin on June 2 with a 69.12m effort. Haddadi ranked fourth in the latest International Association of Athletics Federations (IAAF) rankings after Lithuanian Virgilijus Alekna, Estonian Gerd Kanter and Spain's Mario Pestano.